Andrew Gillum, Democratic candidate for Florida governor and Tallahassee mayor, told the “Pod Save America” podcast earlier this week that police have already gone too far if they have to reach for a weapon. 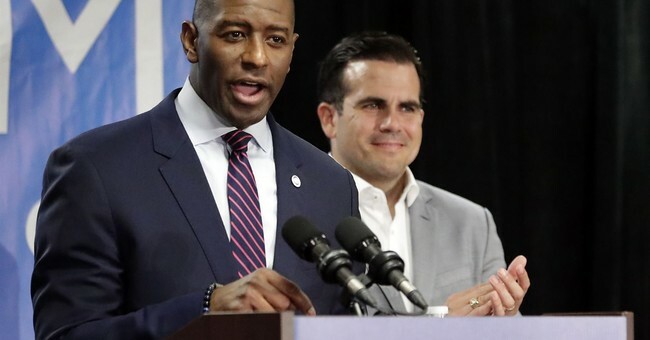 "I'm for police accountability," Gillum said, "but law enforcement society cannot work and, quite frankly, law enforcement can’t do its job if it does not have a trusting relationship with the community." "At the time that a law enforcement official has to go to a weapon, to a gun, to a baton, to a taser, then they have already have to go too far by their very presence," he argued. "By the very trust that they inspire in community and in society, they are supposed to be able to bring most situations to heel." Gillum said he was focused on "repairing the breach, making sure that there is a good community relationship” with police. The Bernie Sanders-backed candidate secured an impressive victory in his August primary and advocates some far-left positions such as abolishing ICE and establishing Medicare for All. He was given a "pants on fire" rating from Politifact for claiming that Florida's low unemployment rate was due to people working "two and three jobs just to make ends meet." He has been facing scrutiny recently over accepting Hamilton tickets from an undercover FBI agent who was conducting an ethics probe. Gillum insists that he received the tickets from his brother and accused the GOP of attempting to reinforce “stereotypes about black men" by bringing up the allegations. Gillum is running a tight race against Trump-backed Rep. Ron DeSantis (R-FL), according to the latest polling.